or .... "SEEING YOUR WAY TO SHOOT AS THE YEARS ADVANCE"
We occasionally receive comment from those shooting that they no longer enter the Service competitions using open sights because of a deteriorating sight picture. It can be possible to become competitive again by dint of the employment of an Orthoptic aperture. Put simply, this is a small disk with an hole of about 1mm in it, fitted behind, or even in front of, your shooting prescription lens. An adjustable pistol type iris may also be used, if such can be located. If you have not done so already, this is really worth a try for both small and full-bore use. It is NOT suitable (nor permissible) for use with a rifle that is already fitted with an aperture rear sight. Modern target rifle disciplines, along with historic target disciplines in which aperture sights can be used, present few problems as long as you have a suitable pair of "specs" with a lens of your correct prescription. Shooting over open sights can be a very different matter. When speaking to historic rifle shooters at fairs, meetings and over the telephone, reports of difficulties in obtaining a decent sight picture over open sights are all too frequent. We must reiterate the usefulness of an orthoptic. A simple thin 1" diameter disc drilled with about a 1mm hole and either used on its own, or placed in front of your shooting lens, will make such a difference that you will wonder why you never tried it before. Over 50 ? Then this could be for you ! Our natural desire to avoid overdoing shooting paraphernalia is laudable, but some of us now using these traditional and historically acceptable devices probably couldn't see the target without them! Give them a go......... I made my own in about half an hour by drilling a small aluminium disc and painting it matt black, but other adaptations can be easily achieved. Indeed, I have used a plain disc quite successfully for several years now. Two images of such home-brewed arrangements are shown in the section below. The following excerpt from "SHARPSHOOTING for WAR and DEFENCE" by W.W. Greener comments on the orthoptic, in this case with a six-hole aperture disc. His comment on alignment of the aperture with the sights was really only relevant to the designs of the day. Appropriate adjustment can nowadays quite easily be arranged.
" BLUR. - This occurs with all, and is very troublesome to most rifle shots, especially in certain conditions of light. On a bright evening with the sun behind one it almost disappears, but it is present under most other conditions of light. The inability of the eye to focus the sights and the bull's-eye at the same time is the cause of the blur. The reason it is not noticed with a perfect light from the rear is probably due to the fact of less light entering the eye obliquely. parallel rays from entering the eye. 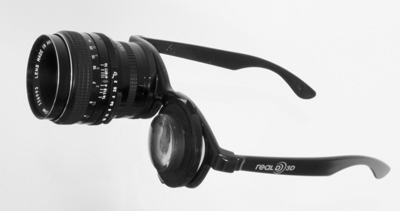 Orthoptic spectacles are undoubtedly of great assisstance, but the disadvantage gained by using them is somewhat discounted by the trouble experienced in aligning the aperture with the sights, so they are usually made adjustable in any position to overcome, as far as possible, this difficulty. They obstruct the vision of the shooting eye, and weather conditions cannot be so easily noticed." This last point ignores the fact that without the orthoptic, many older shooters wouldn't even be able to properly see the target or the sights, let alone the weather and peripheral view! Here is an example of a variable pistol-style aperture fitted behind a shooting lens. If this is not possible to arrange, then a simple thin metal or plastic disc, with about a 1 mm hole drilled in the centre, can be clipped or taped behind your shooting or everyday spectacles for a tryout. Below is a 'Heath-Robinson', but effective, arrangement - made utilising radio-controlled model aircraft parts easily obtainable from any model shop. 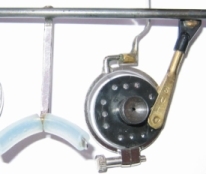 The plastic disc is more usually fitted to a rudder or elevator control-servo, and the brass and plastic links are the end links for the model aircraft control-rods, screwed together on the threaded section of a control-rod end. The disc has a Parker-Hale screw-in aperture just wound into the boss - a perfect fit - and enabling aperture size changes if needed. The whole can be swung away or removed if not required, and adjusted for position by rotating it on the eccentric pivot. A plain drilled disc originally carried out this task quite satisfactorily - even a drilled small coin would suffice. The improvement in sight-picture seen over a "V"-notch and barleycorn or blade has to be seen to be believed. N.B. Regulations obviously only permit the fitting of an orthoptic aperture to the spectacles - NOT to the RIFLE, where it becomes a rear aperture sight! 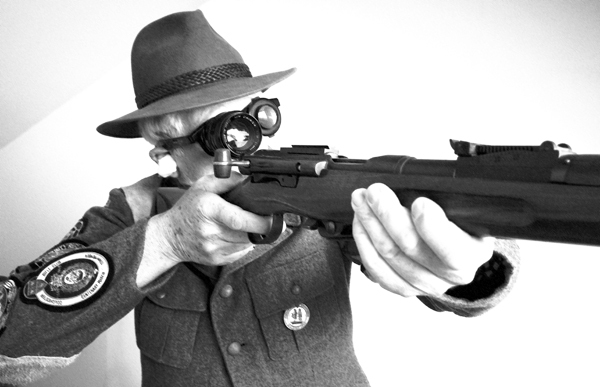 Some rifle shooters have been known to go to extreme lengths to improve their sight picture in this way; that is by combining an orthoptic aperture and their prescription lenses to obtain the ideal result. It is not for every body, but Les King is pictured, below, twenty-five years ago with his shooting specs. You should see the ones he uses to shoot the Miniature League Service class nowadays! The photograph, hitherto shown above, had been present on this page for the best part of fifteen years, and was attributed in jest to being of the target-shooting worthy Les King. It was actually of a fine young gentleman wearing the most complicated and heavy pair of shooting-style spectacles, with the "shooting" eye fronted by a lens that gave a fair impression of a compact telescope, about two inches in diameter and three inches or more in length. The outfit would most certainly have raised much amusing comment on any range. We have today (26th. May 2013) been advised that this image was a modified and cropped monochrome reversal of a photograph of one Johnny Depp from the rushes of the film "Sleepy Hollow. We regret that we had no knowledge of whom this photograph was, nor of its source, the photograph having been passed to us without reference by a shooter with an evidently wicked sense of humour - and, yes, we ought to have double-checked its origin. Use of copyrighted material without permission is something we take especial care in trying to avoid, not least because so many of our own photographs are now spread widely about the world-wide-web with neither permission nor acknowledgement, and we prefer to do as we would be done by. But mistakes are made, and we apologise in advance for this possibility within our own copyright page, specifically requesting to be advised by interested parties of any such transgression. On this occasion we erroneously believed the photograph to be old and outwith copyright. We have now been told in no uncertain terms that we have unwittingly been breaching copyright, and that we could have jeopardised the good name of the NRA, NSRA and associated organisations by risking the attraction of legal action for breach of copyright. As a separate and minor organisation, albeit only very loosely associated with our aforementioned National shooting bodies, this is the last thing for which we would wish to be held responsible. We feel it only fair to show credit where credit is due for the vigilance and public-spiritedness shown in spotting and reporting our lack of care in authouring that has gone unnoticed for so many years, and to therefore quote the lines from our alerting correspondent's carefully worded cautionary email, and to thank him for his timely, sensible and helpful warning, upon which we have acted, we hope, just as St. Expeditus would have expected. advantage in using a factually based description to promote a sale that has no credence." "Can you explain why you have allowed the use of a photograph of Johnny Depp in the film Sleepy Hollow as a copyrighted image of Les King with his optical enhancement in your Orthoptics section?" Please see attached copyrighted images. I am sure this is an oversight on the part of the website builder. But I am sure you will agree that copyright has been breached as there is no corrected mention of the source. This might bring into disrepute any other facts that the NRA and NSRA may wish to promote in support of shooting sports. As you can no doubt see it is a reversed copy of the exact image of Mr Depp taken from rushes of the film. The reversal thus attempting to cover the fact that the wearer is wearing this on the wrong eye. I assume that Les King was right handed with dominant right eye. This adds to the deception the web master has tried to achieve. "I would strongly suggest that the image is removed in view of the millions of US dollars that film companies have in reserve for law suits. I would imagine although the cash strapped National Rifle Association GB and subsidiary organisations might consider this as trivial, the association has a high enough profile to cause this to be a trial case. Then there is the use of Mr Depp's face in connection with a sport that he may or may not like to be connected with. You know how sensitive millionaire actors can be over matters beyond their understanding. "This email, fortunately, is from a pro-shooting sport NSRA member, but could easily have been from a representative of the film company (sole copyright) or Mr Depp's legal advisers. He just happens to reside in the UK now." Mr. King has recently updated his orthoptic shooting spectacles, and we show him below putting them to good use. ............... and here are those innovative spectacles themselves, which we hope may inspire the many of we more mature shooters to greater things.